Guru Nanak Dev University was established at Amritsar on November 24, 1969 to mark the 500th birth anniversary of Sri Guru Nanak Dev Ji. It is both a residential and an affiliating university. In conceiving the future course of the University, the objectives enshrined in the Guru Nanak Dev University Act 1969, emphasised that the new University would make provision for imparting education and promoting research in the humanities, learned professions, sciences, especially of applied nature and technology. Studies and research on the life and teachings of Guru Nanak, in addition to working towards the promotion of Punjabi language and spreading education among educationally backward classes and communities were the other commitments. In consonance with these expectations, the University in its eventful history of 43 years has taken long strides in spreading the message of the Guru and promoting education in such fields as science, arts, management, information technology, industrial technology, environment, planning and architecture. Carefully nurtured by committed academia, the University has carved a niche for itself in the academic world. The motto of the University as engraved on its emblem Guru’s wisdom illumines all speaks of the vision and idealism for which the University stands. Spread over a stretch of 500 acres towards the west of the City, Guru Nanak Dev University presents a picture of modern architecture. Traditional red brick geometrical blocks represent its regard for time-honoured values and commitment to scientific advancement. Making its humble beginning in an annexe of the adjoining Khalsa College, the University today boasts of 37 academic departments, four regional centres, seven constituent colleges and a score of support service departments besides several administrative offices. In recent years, the University has diversified in a big way its programmes into applied sciences making it one of the distinguished centres of industry related job-oriented courses. It is highly innovative in designing its teaching and research programmes and offers a comprehensive range of general and applied courses. State of the art instrumentation facility has been created in the Emerging life-science building which will provide a boost to the research activities. At present, nearly 5000 students are studying on the Campus, 4 College, All India Services Training Centre, Instrumentation Centre, Computer Centre, 24 hour internet facility, Placement Unit etc. To promote research among its faculty, almost all the Departments have been provided with independent computer facilities, internet connectivity and departmental libraries. In addition to the academics, the University has also created necessary facilities for recreation and all round development of students and faculty in the form of Department of Youth Services, National Service Scheme, a 900 seat all purpose auditorium, half a dozen seminar and conference halls, a modern hi-tech sports complex, sports hostel, faculty club, students’ centre, health centre, day care centre, two separate holiday homes at Dalhousie for teachers and students, working women hostel, Baba Buddha College Bhawan along with on campus residential facilities for a large number of students, teachers and administrative staff. The Campus with its lush green grounds, swaying fields, blossom laden tree lined lanes provides a most conducive physical environment for work and progress. The University takes pride in the fact that its community over the years has developed a great participative work culture. The University has won Maulana Abul Kalam Azad Trophy 17 times and inter-versity youth festival championship four times consecutively. UGC has granted the University Centre for Excellence in Sports Sciences. National Assessment and Accreditation Council accredited the University at the "Five Star Level". Recently in Dec., 2011, the University has award with “University with Potential for Excellence”. Being rated at such a high level will inspire its community to make strides ahead still faster and stronger with academic excellence and commitment to social upliftment as the core ideals. A very large number of them being girl students drawn from the neighbouring countryside. The University has contributed tremendously in accessing higher education to women in this otherwise educationally backward area. Being an affiliating University, it also .performs the parenting role of directing and monitoring the academic programmes of more than 150 colleges located in the five districts of Amritsar, Jalandhar, Kapurthala, Nawanshehar and Gurdaspur, some of which have a long and creditable history of imparting higher education since late nineteenth century. 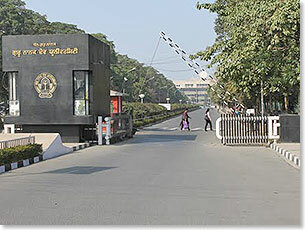 Over the years, the University has built up an excellent academic infrastructure in the form of a well stocked computerised library, state-of-the-art laboratories, Academic Staff.